← My Book is on Nook! Sometimes my brain rambles. I have been thinking about this recent shooting of young Mike Brown in St. Louis and the rioting that followed. Rodney King revisits us in 2014. I think about Trayvon Martin. I think about Eric Garner being choked to death in NYC. A fellow buys a pack of cigs and begins selling them individually. He is confronted by the police for selling untaxed cigs or some other related unlicensed issue. But wait a minute. There is a large Second Amendment push to make sure that individuals can privately possess and privately sell guns, without tax, license, or background check. So if Mr. Garner had been selling a privately owned gun would he have been touted as an American hero? But selling single cigarettes makes it appropriate that the police should surround and assault him? This made me think about the rising trend of open carry and stand-your-ground laws that we are seeing in this country. I would imagine that almost everyone believes it is appropriate that guns are not allowed aboard passenger aircraft. Sure, you may not like the TSA pat down, but most would say that no guns on airplanes is a good thing. But wait a minute. What about a city bus? If it isn’t cool to carry a gun on a plane, why would it be cool to carry a gun on a bus? It is a gasoline filled vehicle, with 50 or so passengers, that can travel at high speeds and be used as a bomb of sorts. I guess no one wants to explain how they split that hair. Meanwhile, ISIS rounds up an entire religious community and tells them, ‘convert or die’ and we find ourselves looking at Iraq again. Don’t go blaming Obama. Like him or hate him, he is dealing with what was dealt. Bush went there. Papa Bush went there, and he wasn’t the first. I’ve been reading Arthur Conan Doyle’s stories of Sherlock Holmes. Dr. Watson earned his stripes in the Afghan war – in the 1870’s. Okay, he is a fictional character, but he represents the times that surrounded Doyle. The West has been warring the Middle East for a long, long time. President Eisenhower comes to mind and his fateful warning of the military industrial complex. Perhaps he was wiser than we give him credit for. Perhaps he did not mean complex as in a networking of parts, or as a thing that is difficult to understand. Maybe he meant complex in its third noun form, from psychoanalysis; a group of related, often repressed ideas and impulses that drive characteristic or habitual patterns of thought, feelings, and behavior. Maybe he feared a neurotic military behavior. 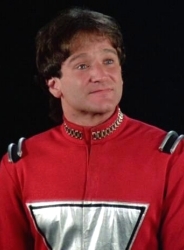 As all these thoughts were rolling around in the cavernous vacuum that is my brain, I learn that Robin Williams has died. Worse, that he took his own life. I cannot extol him enough. He was a shining star of humanity. Quick witted would be too slow a term. Lightening seemed to move at a snail’s pace when compared with his rapid fire abilities. Brilliant would seem too dull. In a 30 second improve he would incorporate voices and characters, make you laugh and cry, and include potty-mouth humor and poignant political rant. He had his flop movies. Some people don’t like him. He was purely human. I have never heard anything that is really against him. I wish for a tenth as much. As I thought about this tragic loss, I am sure that I was struck in the way you were. How could someone who had so much take his life? He had the bucks. He had talent buried under talent, piled on top of talent. He had smarts. He had charisma. He was full of caring. He was loved by almost everyone. How could he feel so low that he would choose to extinguish his flame? Suddenly Mike Brown and the St. Louis riots, Trayvon Martin, the NYC Police, ISIS and Robin Williams coalesced in that empty space between my ears. Fear. Fear of the police or a neighborhood enforcer, so a young boy holds his ground. Fear of people who look different or unfamiliar so the enforcers point their weapons at weaponless people. Fear of some religious ideas so another group with different religious ideas threaten them with death. Fear of those who look differently, speak differently, think differently, causes nations to raise fences and yell at young children fleeing their own fears. Fear of people who have different ideas of bonding cause people to create laws that restrict love and tax breaks to only approved couples. Fear causes nations to build armies beyond all reason. Fear causes people to carry weapons that give them the power of ultimate judgment at the twitch of a finger without thinking, at a time when there are alternatives that will stop a person, but that do not carry that final, irrevocable sentence. Fear makes a brilliant soul that lifts the spirits of millions sink into the deepest depression of unrealized achievement or the fear of not being able to live up to his accolades. “The only thing we have to fear is fear itself.” (Franklin D. Roosevelt) Wiser words may have never been said. Where would the world be without fear? If the police recognized that they are not law “enforcers” but are civil servants and peace officers. If they had the courage to step back, watch the individual to see if there is any need to approach them. What if we did not fear the ugly monsters of “might” and “maybe” and built defenses only for the things that we are fighting, and not against the things we fear we might fight? What if each of us could recognize that every single one of us is loaded with fear? Not just the poor, but the rich. Not just the talentless, but the talented. Not just the downtrodden, but the uplifted. Dark or light, big or small, rich or poor, guy or gal or gay, we are all the same. We are all afraid of something. Some of our fears are grounded and real. Some are foolish and have no meaning. But fear is fear. If each of us recognized that the fear we feel everyone else feels, could we begin to put down the guns? Could we take a step back, lower our voices and stop our rhetoric and shut off the spin cycle when we are not sure? If we could recognize that we are all afraid, could we finally put away our defenses, recognize our similarities and weaknesses, and reach out a helping hand? Until next time, nanoo nanoo.